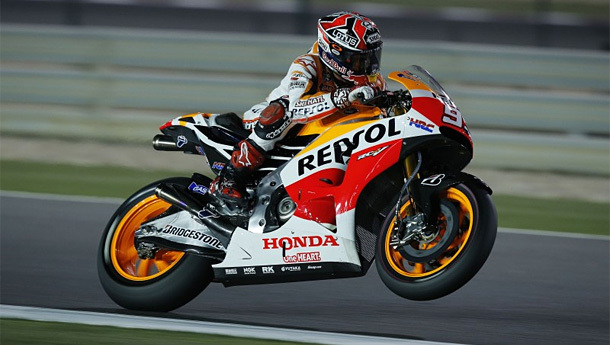 Marc Marquez (Repsol Honda Team) bounced back from a broken leg just six weeks ago to secure the first pole of the season at the Losail circuit in Qatar with a time of 1’54.507, marking his 10th MotoGP career pole, from 19 starts in the class. Marc Marquez: “I’m really happy and this pole position is a special one for me, because after coming back from injury it gives me a boost in confidence. In any case, we know that tomorrow is the day that counts and it’s in the race that points are decided, so we have to be very focused. ‘I love my bike’ – Honda Go&Fun’s Alvaro Bautista. Alvaro Bautista put in a strong performance and will start from second spot on the grid. The Honda Go&Fun rider posted a 1’54.564 in the closing minutes of Q2, just being pushed from pole by World Champion Marquez. Plenty to smile about for Brad Smith after qualifying for his first front row start in MotoGP. 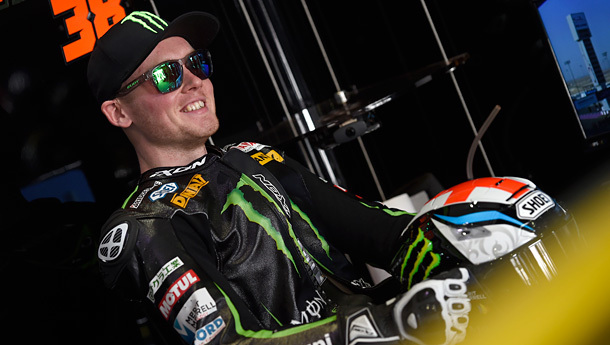 Bradley Smith claimed his first ever MotoGP front row start. The Monster Yamaha Tech 3 rider recovered well from a big highside in FP3, to post a 1’54.901 time in Q2, taking third place on the grid. 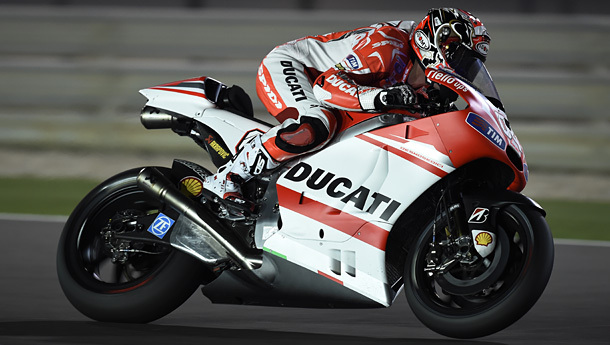 Andrea Dovizioso impressive in qualifying round. Starting from fourth position will be Andrea Dovizioso, Ducati Team (Desmosedici), followed by Jorge Lorenzo (Movistar Yamaha MotoGP) and Repsol Honda’s Dani Pedrosa. 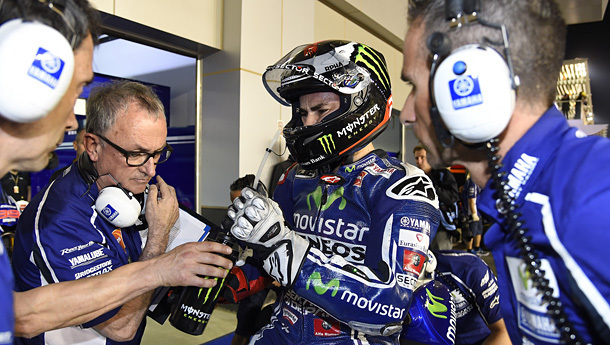 Jorge Lorenzo: “We are improving little by little to adapt to the situation. Obviously we are still having problems with the rear grip but we are getting closer to the front top riders. We made a good position for tomorrow; fifth on the grid is good for the start. Starting from fifth position on the grid won’t be a problem for Yamaha’s Jorge Lorenzo. Dani Pedrosa: “The qualifying session was really closely contested today – especially in the final laps. Looking at things objectively, we have a good pace and were able to set a fast lap in the session, even though in the end we qualified sixth by a really narrow margin. 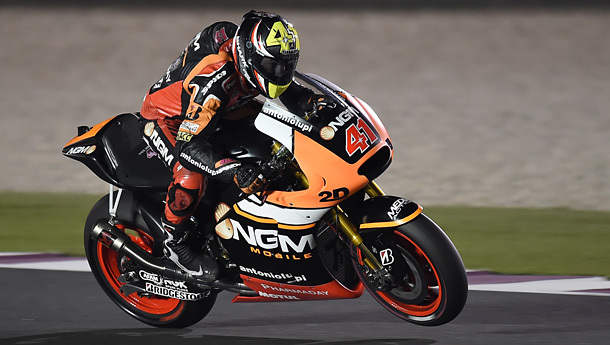 Aleix Espargaro, NGM Forward Racing (Forward Yamaha) will start from ninth position in tomorrow’s race. Stefan Bradl ( LCR Honda MotoGP), Cal Crutchlow (Ducati Team (Desmosedici), Aleix Espargaro, NGM Forward Racing (Forward Yamaha) and Valentino Rossi (Movistar Yamaha MotoGP) completes the top ten. Battling against the elements in windy conditions Aussie Jack Miller (Red Bull KTM Ajo) secured a front row start in third spot while Alex Rins (Estrella Galicia 0,0) starts from pole and team-mate Alex Marquez in second spot. Miller was 0.4s off the pace but looked threatening as he aims to challenge the dominant Spaniards this year. The second row comprises Calvo Team colleagues Jakub Kornfeil and Isaac Viñales, alongside Englishman Danny Kent in the new Red Bull Husqvarna Ajo structure. 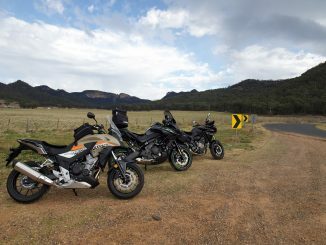 The trio all qualified within a second of Rins. Arthur Sissis (Mahindra Racing) recovered from a Friday fever to qualify 29th.